Sean Dorsey says THE MISSING GENERATION was choreographed to give voice “to longtime survivors of the early AIDS epidemic; it is a love letter to a forgotten generation of survivors – those who witnessed and experienced the loss of part of an entire generation of gay/bi and transgender people to AIDS in the 1980s and 1990s. Our culture has largely turned its back on this generation of survivors. I want us to turn and look at you now” (2015 BDF program for Sean Dorsey Dance). “I want us to turn and look at you now.” I cannot think of a medium more powerful than dance to do just that. This medium allows content to be shared between performers and audience in a dynamic way, full of life itself. THE MISSING GENERATION is a multidimensional experience. The arc of this work is defined by recorded oral histories, seamed together by a rich soundscape, eloquent costumes, and a lean light design offering striking images of individual and collective joy and pain. 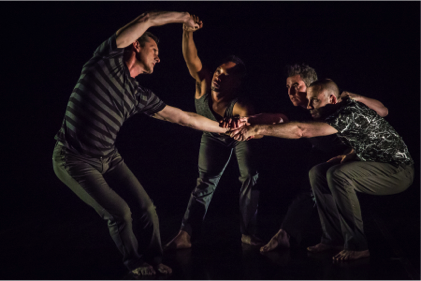 Central to this gift to AIDS survivors, and to those who did not survive, is a quartet of dancers lovingly bringing to life three decades of history, loss, and emotion. After the final downstage left toplight faded out, the audience sat silent, contemplating the full impact of this evening-length work. Once the energy of the performance subsided, and the theater emptied, I sat with image after image going through my mind. What was it that made this dance so special? Certainly the immediacy of the Sean Dorsey Dancers presenting THE MISSING GENERATION was very powerful, but there was something much more. Through his research and choreographic process, Dorsey discovered narratives able to put in perspective the magnitude of what was the early AIDS crisis in America. Back in my office I read through more research, including Lawrence K. Altman’s July 3, 1981 New York Times article, “Rare Cancer Seen in 41 Homosexuals.” It was chilling to read this article knowing what we know now. What was to follow was a very complex public health crisis that was visible and not visible. Beyond the headlines were thousands of individual stories of people left alone to wrestle with this devastating disease while the nation wrestled to understand the cause and the communities most affected by it early on. Conceptually, this idea of ‘beyond visibility’ seemed to become clearer as I reviewed the performance elements of THE MISSING GENERATION. More specifically, as I thought about Clyde Sheets’ design, I began to truly appreciate his eloquent use of light to bring this dance, and larger story, to life. If Sean Dorsey’s mantra is “less is more,” and process words like distill, edit, rework, and reshape reflect work in the studio, then Sheets’ design offered a precise, minimal, and rhythmic world of light, dark, highlight, shadow, limited color, and pattern, where the themes of the dance could emerge uncluttered. At the same time, Dorsey referred to what was lost and what was forgotten about the AIDS crisis and its victims. This vacuum is ever present on stage. It appears as the black negative space surrounding dancer Brian Fisher as he is etched by medium intensity sidelight. Or, it is apparent as the dance starts when Dorsey moves alone in a toplight pool amidst a stage enveloped in darkness. At this moment there is a sense of expectancy, a need to know what will fill the stage as the boundary of this light gives way to the unfolding dance. The unlit areas of the stage are ominous, waiting to be filled with movement, light, and life. Yes, one of the aims of stage lighting is visibility—we need to see the body in time and space to understand choreographic expression. But we also know that light can be skillfully used to emphasize dimension (sidelight, toplight, backlight), sculpting the body with an interplay of light and shadow. In a dance like THE MISSING GENERATION theme is ever present; light elucidates inherent choreographic ideas through direction, angle, quality (pattern, color, distribution, intensity), and rhythm (cueing or the movement of light). The visual score emerges, and when coupled with all other elements, brings unity to the work. Sheets punctuated the choreographic world with compositional variation through direction of light, color, and pattern. Direction of light either enhanced forward motion on stage, or intentionally added weight to the choreography through high contrast. Color, warm and cool tones, emerged as the dance progressed, only to be stripped away at the end as the reality of the entire work set in. Pattern was at times substantial and abstract, the large rectangular box stage right for example, or was more delicate and detailed, the Penn Station floor images for example. Thus light itself was beyond visibility as it underscored theme, emotion, and place. The light score became a breathing entity in the work, allowing Dorsey’s choreographic journey to unfold visually, always guided by the oral histories. This is the magic and power of light. It allows us to see, then allows us to really see and understand, as we think about what motivates this light and why the designer shaped it the way she or he did. Beyond visibility means we can take in the images on stage, decipher thought behind them, and use this meaning for a far richer performance experience. THE MISSING GENERATION offers just this kind of opportunity. The dance ends similar to how it started, with a stark toplight pool stage left. This time however, the quartet embraces, implying that together, with compassion, we will turn and look at the missing generation. This post was written by Jim Thurston. Jim is a professional designer and educator researching the relationship between choreography and design for the stage. He is the chair of the Department of Theater and Dance at Colby College and is delighted to collaborate with artists and scholars at the Bates Dance Festival.